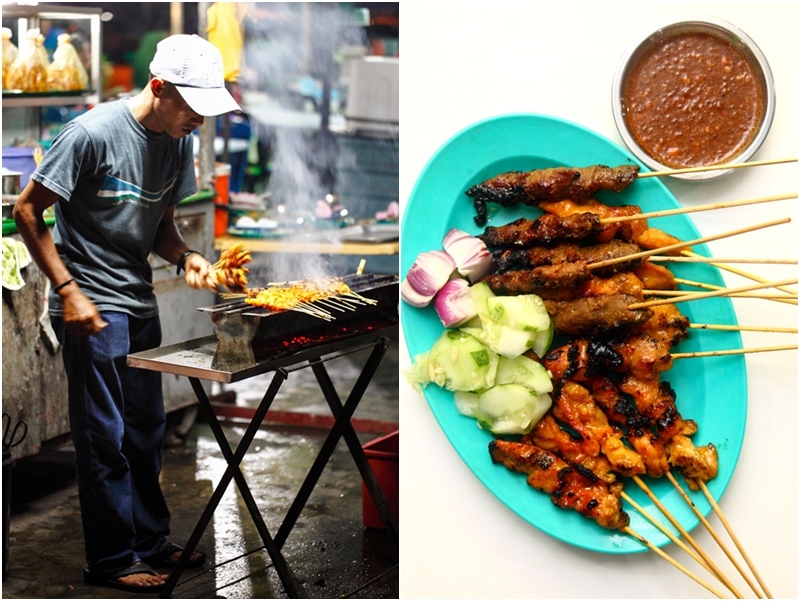 There are easily thousands of satay stalls in Klang Valley. 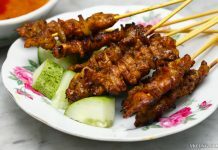 It’s impossible to try each and every one of them but here’s a list to help you get started on a satay adventure. This list is not final and will be updated and expanded periodically. All of the featured eateries are halal. Also, there are many famous satay stalls/restaurants that I have been to, but they are not included due to drop in quality recently. 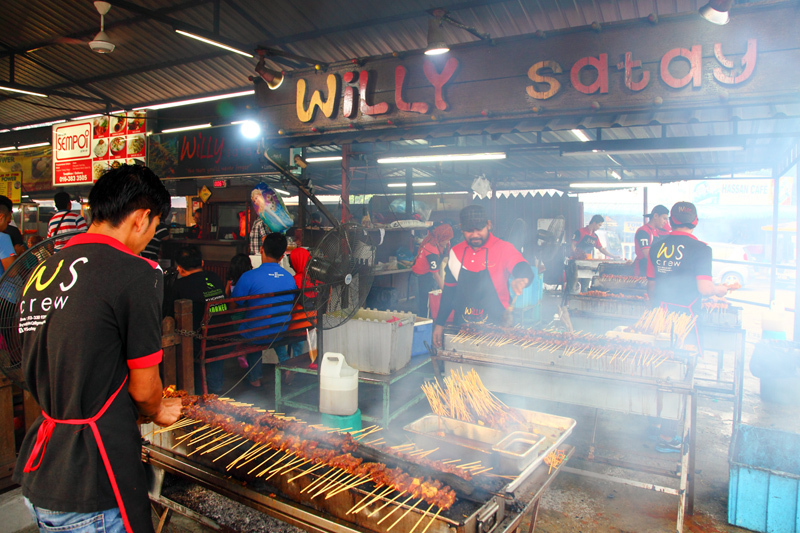 Looking at the number of grills at Willy Satay, the long queue of customers and the amount of satay each customer orders, I wouldn’t be surprised if they could sell over 10,000 skewers everyday. Even though the workers were grilling probably hundreds of satay at any time, the satay managed to come out mostly nicely cooked without too much burnt parts. So, quality control is definitely there. Compared to the usual road-side satay, Willy’s chicken satay has thick chunky meat mixed with a reasonable amount of chicken skin for the juicy texture. It’s well marinated, tastes very delicious and we thoroughly enjoyed the tenderness of the sweet and savory meat that had a pleasantly strong lemongrass flavor. Pak Din’s satay stall is a small road side eatery that serves only satay and maybe a couple of drinks. It feels more like a warung than a full fledged restaurant. Price-wise, they are in line with most and cheaper than some, definitely worth paying for the quality of food you’re receiving. Choices are rather limited though since they only offer chicken, beef and lamb satay. Their prices are RM0.80, RM0.90 and RM1.40 each respectively. As usual the beef satay is a notch better than the rest. It’s in fact the best beef satay I have tasted thus far – succulent, aromatic, extremely flavorful and burst with juice when you bite into it. Terrific stuff. Satay Sri Melaka operates from a stall in a ‘warung’ in Lembah Keramat and it’s obvious that they are the most popular one. There have two to three grills fired at any time just to cater to the onslaught of orders, mostly from take aways. All the satay had an extraordinary deep flavor and you could certainly taste the special spices they use to marinate them. The satay sauce was deliciously sweet with an adequate hint of spiciness. We even couldn’t resist ourselves from drinking it, because it IS that good and not jelak at all! For a first time visitor, Dato Keramat could be confusing to navigate but thanks to my GPS device we found the restaurant with relative ease. Zainah Ismail could be easily identified by the smoke and satay fragrance constantly oozing out of one of the wooden restaurant. 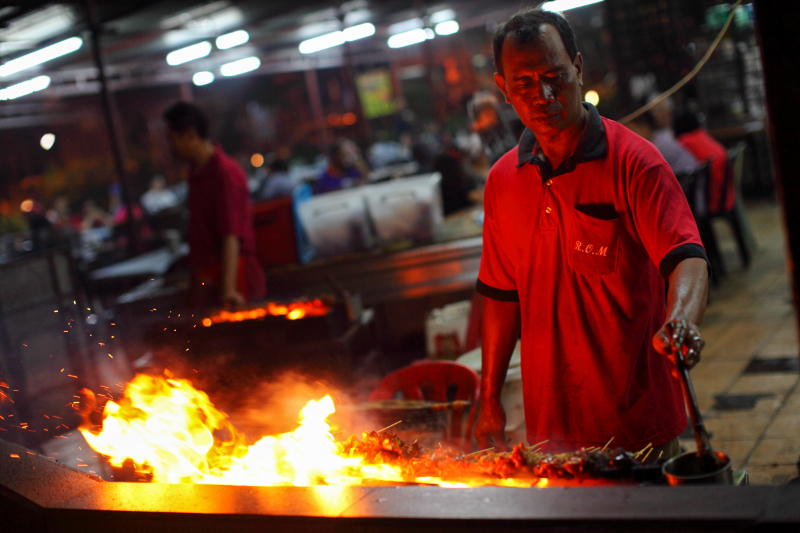 Five satay grills are used here and the satays are actually grilled by stages. 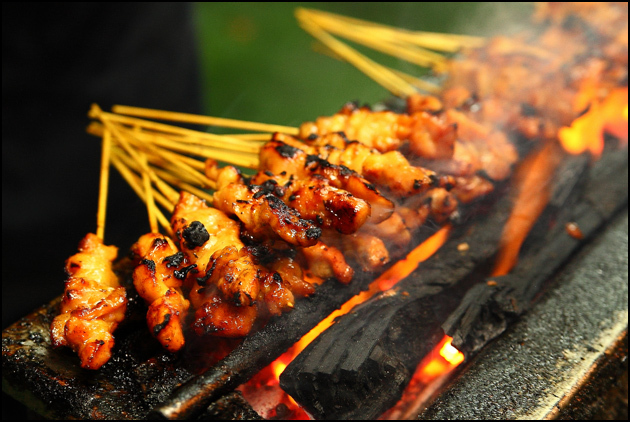 The satays do not stay on one grill from raw to cooked. Instead, they are transferred to the next grill once a particular ‘doneness’ is achieved. The meat on each skewer is chunky and lean with little fat or skin, which would take at least three bites for the average person to finish one stick. A pair of brothers-in-law run Nur Satay and their roles are clear cut: one does the grilling while the other takes care of the rest. Despite the hecticness, I am pleased to say that the brothers are always cool and friendly. 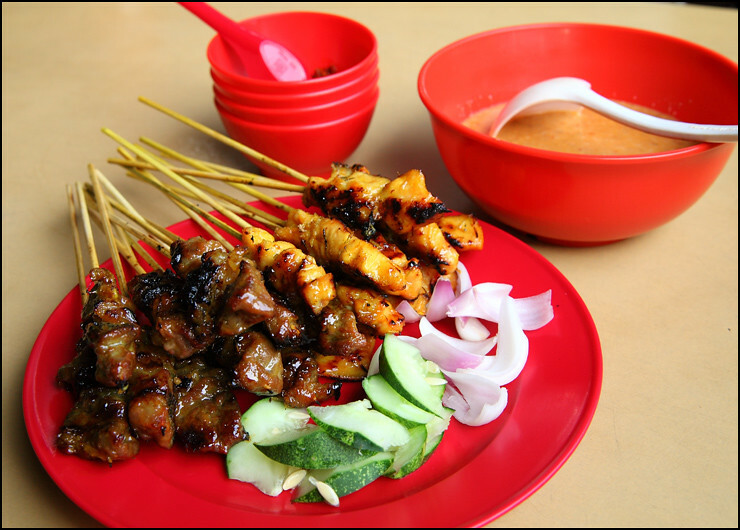 Prices are kept delightfully low, making them one of the most affordable satay stalls in KL currently. Chicken, beef, tripe, liver satays and ketupat are available at RM0.80 each. 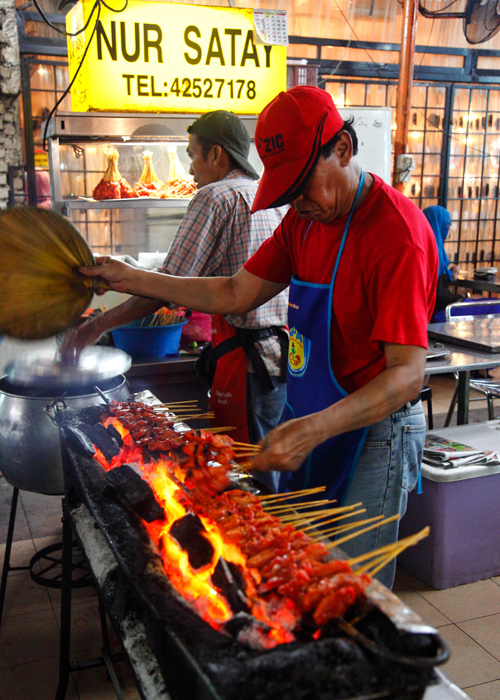 Sate Atok is located in Taman Segambut SPPK and their recipe has been handed down in the family for generations. So that probably explains why their satay is a notch better than the rest. There are four types of satay available: chicken (RM0.70), beef (RM0.80), lamb (RM1) and tripe (RM0.90). Among all, the chicken and beef are the best tasting ones for us. Both are well-marinated and do not rely solely on the satay sauce to deliver. As for the satay sauce, I think it’s one of the best ones around. It’s rich, full of grounded peanuts and not oily, so it coats the satay easily for a mouthful of flavors. Kasim Satay is probably the busiest satay stall in Sentul. The stall operates in Sentul’s wet market (Pasar Sentul) at night and most customers take away because the location is not so conductive for dining in. Prices are reasonable and worth it considering the high ratio of meat to fat content on each skewer, it was close to 70-30. The big flame is definitely fun to look at and makes the waiting less boring. Despite the high heat, the satay manage to come out decent without a lot of charred parts. 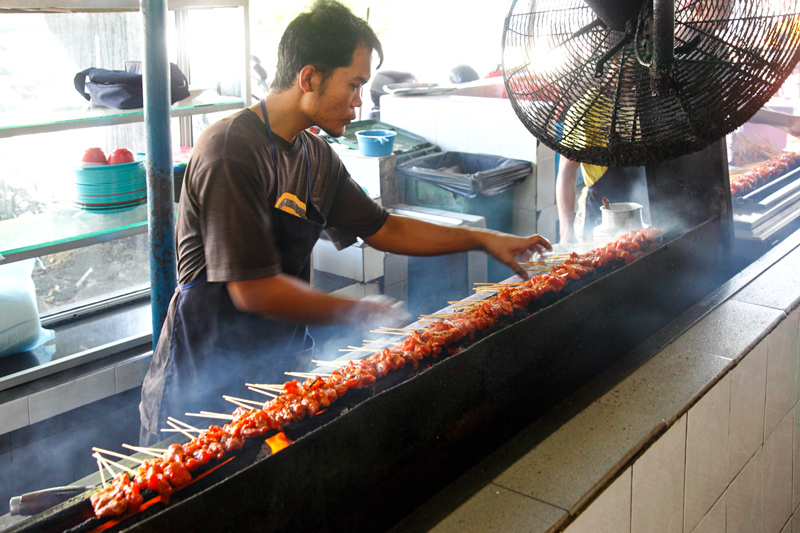 Besides using the best ingredients, one of the secrets in Klasik Satay Station lies in the oily baste. You know, the tin of oil satay sellers would dip their self made lemongrass brush into? If you look carefully it does look very different from the rest, which are usually just cooking oil. The mutton satay (RM1.20) remains the best among the two other meats: chicken (RM0.70) and beef (RM1). I would have given the chicken satay a better rating if not because some of them were so badly burnt – trimming the parts off would have done them a lot of good. Business at HJ Senen Satay is brisk and the workers are always busy grilling away to fulfill the orders that kept piling in. 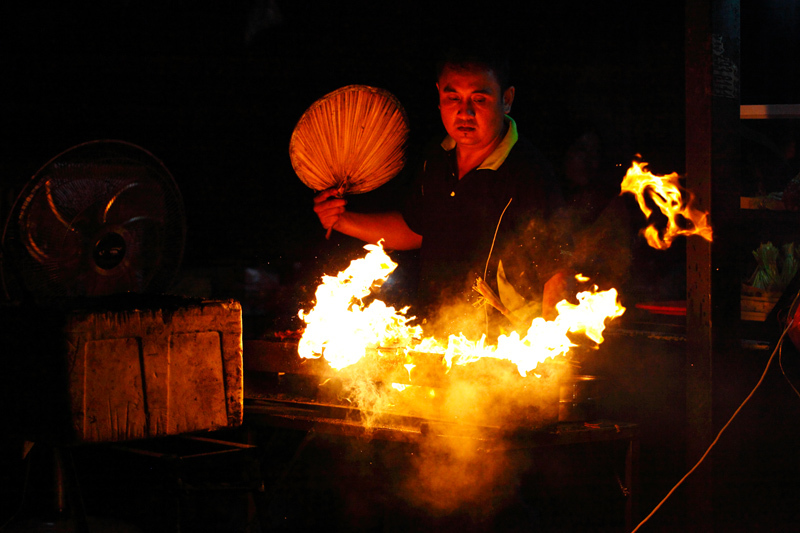 As you can see the flame is very strong compared to the other stalls where a slow grill method is usually employed. Like Klasik Satay Station, HJ Senen’s satay also suffers from having a lot of burnt parts. But if you could look past that flaw, they have the potential to be great. Taste wise it was undoubtedly satisfying (provided you discard the burnt parts) and you could really feel the fleshiness of the satay here. Between the chicken and beef, I prefer the later because it was more flavourful and the meat was surprisingly tender despite looking tough and chewy. Did I miss out anything? Do you have a recommendation for me? Drop me a comment below!